The Product Waitlist app enables customers to request an email notification when an out-of-stock product comes back into stock. You can track demand for out-of-stock items, making sure your customers feel informed and more likely to buy. Build up a waiting list of people wanting unavailable items, then notify these customers automatically when products come back in stock. 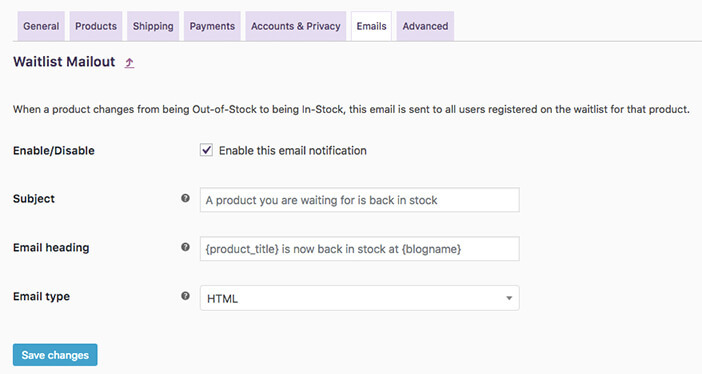 Allow customers to be notified when they can purchase an item that is currently out of stock. Easily identify most wanted products in order to prioritise re-stocking. Allow customers to easily review and edit their waiting lists. Maintain a record of users that have been emailed a back-in-stock notification. No setup required - just activate and go! Once you've activated the Product Waitlist app in your website admin panel, your out-of-stock products will automatically display a waitlist button for customers to join to be notified when that product comes back in stock. A few settings are available to customise the functionality too, you can find them under "Settings > Store Settings > Products > Waitlist". Waitlists require registration - Enable this to disable guests from joining waitlists by requiring them to create an account. Archive Waitlists - Maintain a record of waitlists when customers are notified of products coming back into stock and removed from the lists. 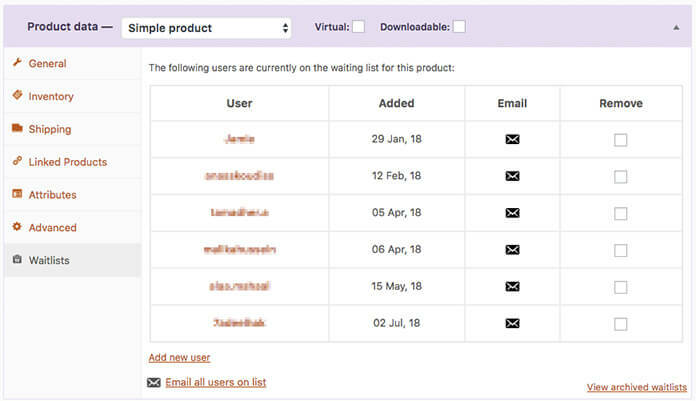 The Product Waitlist app adds a new column to the Products listing in the admin panel (under "Products > All Products"), which displays the number of users on the waiting list for each product. This column is also sortable to enable Admins & Shop Managers to quickly find the most sought after products in the catalog. The Product Waitlist app adds a new product tab to the edit Product screen's "Product Data" box which displays any customers that are currently on the waiting list for the product, any customers that were sent a back-in-stock notification email and subsequently removed from the waiting list (if archiving is enabled) and available options for the product. You can also add email addresses to waitlist (both single or multiple email addresses separated by a comma), remove customers from the waitlist, manually send out back-in-stock notification emails or send custom emails. On the archive tab are options to add users back to the waiting list (these users will remain in the archive until deleted), delete users from the archive or send a custom email. If a customer removes themselves from the archive (via the "My Waitlists" tab on the front-end "My Account" page), this tab will also reflect this. 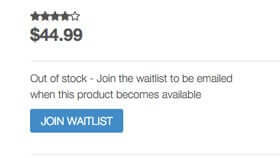 When a product is switched from "out of stock" status to "in stock", The Product Waitlist app will by default automatically send all users on the product's waitlist an email informing them that the product is now back in stock, along with a link to the product listing to purchase. The Subject and Heading can be altered, or the automated emails function can even be disabled from "Settings > Store Settings > Emails > Waitlist Mailout". Once this email is sent, the users are removed from the waitlist for the product. If the product is subsequently switched back to "out of stock", the waitlist will remain empty.